This year, 21 February is Fat Tuesday, Shrove Tuesday, Fastnact Day! Historically, this is the day that Christians would eat all the rich food in their cupboards like eggs, butter and milk in preparation for the fasting of Lent. In the UK we use it as an excuse to celebrate the pancake as well. In the US, pancakes are thick and fluffy and melty and served with fruit compote (as in Rooty Tooty Fresh & Fruity), whip cream and most likely maple syrup (or all of the above if you’re being really fat at IHOP)but in the UK, pancakes are thin and flimsy, resembling French crepes, served sweet or savory. Interestingly, in the UK flapjacks are oatmeal granola bars and not pancakes (so confusing). 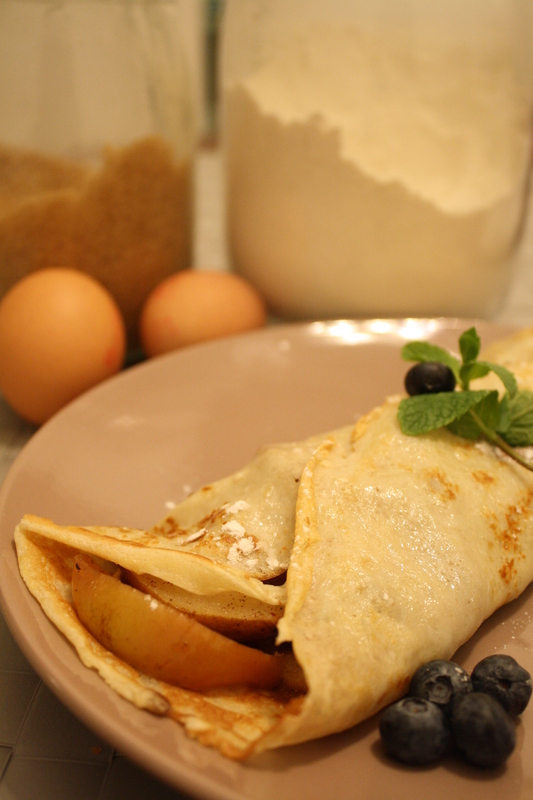 Having been to Paris, where you can buy crepes on just about every corner, I’ve learned that they are great for breakfast, lunch or dinner and they never get boring. Throw in some scrambled eggs and bacon and you’ve got a handy breakfast you can eat on your commute. Try sliced bananas and Nutella for a tastier alternative to toast. Stuff the pancake with ham, cheese and sautéed mushrooms and onions for a quick lunch or dinner. Add strawberries in sugar syrup rolled up with a dollop of whipped cream and you’ve got an easy dessert for your dinner party. The only limit is your imagination. Mix all ingredients in bowl in the order listed. To avoid lumps, add milk to flour slowly while continuously stirring. Add the butter to the mixture in the same way to avoid cooking the batter. Once mixed, cover and place in fridge for an hour (or make the night before). When the batter is ready, heat the pan to medium high heat. 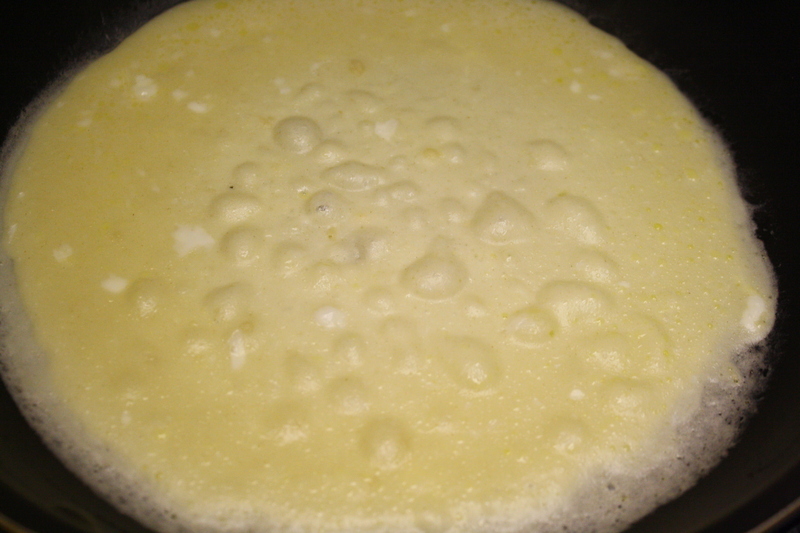 When pan is hot, ladle or spoon about ¼ cup of batter. 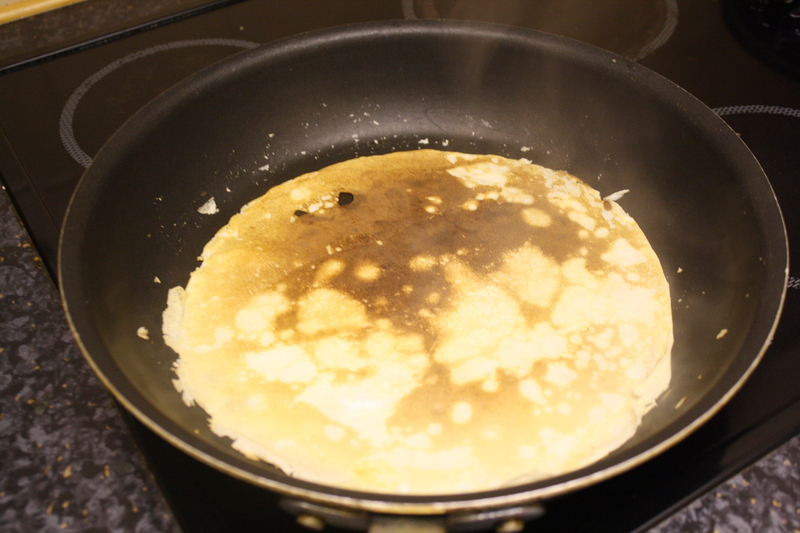 Pick up the pan and swirl batter around so that there is a thin layer of batter across the whole pan. When the edges look dry and there are bubbles across the entire surface, it’s time to flip. If you’re really skillful you can flip it in the pan, I don’t have that many skills. Using the spatula ease the pancake out of the pan and flip. If you don’t quite make it, just straighten it out with your hands. Cook for a minute more and then place on a plate. Separate pancakes with wax paper to keep them from sticking. Fill the pancakes with your favorite flavors. In a non-stick pan, combine 2 skin on apples (cored and sliced into wedges), 1 tbls butter, and 2 heaping tbls sugar, 1 tsp cinnamon. Cover and cook on medium high heat for 5 minutes until fruit has begun to soften. Add 2 pears (seeds and stem removed sliced into wedges) cover and continue to cook, stirring occasionally until the fruit has soften and sugar has turned into a syrup. This is about another 10 minutes. Increase the recipe as needed. Cover 1/2 of crepe with 1 tbls Nutella spread. Thinly slice two small bananas and place on top of Nutella and roll crepe. Remove the leaves and slice 1 pint strawberries. Place strawberries in a non-metallic bowl and cover with 1/2 cup sugar. Cover bowl and refrigerate overnight. When ready to serve, use Cool Whip or beat 1/4 cup whipping cream or double cream until stiff. Fill crepe with strawberries, roll crepe and place a dollop of cream on top. Drizzle strawberry syrup on crepe. Using deli counter ham, cover half of crepe immediately after flipping the crepe. Add 1/4 cup grated cheddar cheese. When crepe has cooked, fold uncovered side of crepe over meat and cheese and then fold crepe in half. Let crepe stand in hot pan until cheese melts. I like your Nutella pancakes.